Handbook of the diagnosis and treatment of skin diseases. Philadelphia : P. Blakiston, Son & Co., 1889. Description : [2nd ed., enl. & rev. ], [2 l.] pl., [i]-xv, -410 p., [6 l.] pl. ; ill.: 6 photo pl., 2 chromo pl., text engrs., tbls. ; 21 cm. Photograph : photoengravings, plates II-VIII. Subject : Skin — Diagnosis and treatment. Author caption: By Arthur Van Harlingen, M.D., Professor of Diseases of the Skin in the Philadelphia Polyclinic and College for Graduates in Medicine, Clinical Lecturer on Dermatology in the Jefferson Medical College. Medical degree, University of Pennsylvania, 1867. Lecturer on dermatology at Jefferson Medical College. Professor of dermatology at the Philadelphia Polyclinic. First edition with 2 chromo plates, 1884. No photographs in the first edition. Third edition, enl. and rev., 1895. Fourth edition, rev. and rearranged, 1907. Fourth edition title, Text-book of diseases of the skin. Written as an expedient alphabetized reference book for the clinician. Plates I and II are chromolithographs, the remaining six plates are photoengravings, two images to a plate. 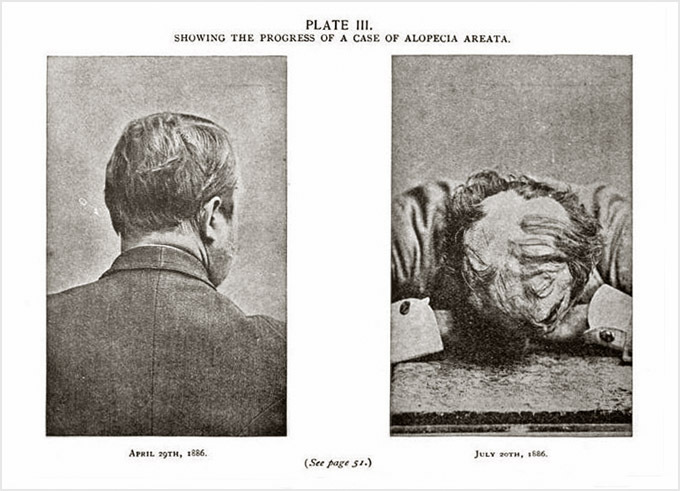 The six images comprising plates III to V are original, representing the progress of a single case of alopecia areata. The images on plates VI-VIII were borrowed from other authors including Recklinghausen's case of fibroma molluscum (Tafel II, v. intra: »»), followed by two sets of leprosy images reproduced from Monatshefte für praktische Dermatologie, not cited, but probably Wolff's Lepraerinnerungen aus Norwegen. Wolff probably procured the images from Leloir, but only the female subject (Plate VIII) can be found in Leloir's great monograph, Traité pratique et théorique de la lèpre (Planche IX).